Remember Dan Reed Network? If you don’t, no sweat. Dan Reed Network became a pretty big band in Sweden and Great Britain in the late 80’s and released three brilliant records full of funked up rock ’n’ roll that worked just as well on a dance floor in a club as on a big stage. But even though the band had really strong material, were all brilliant musicians and toured like crazy, opening for the likes of Bon Jovi and Rolling Stones, they weren’t getting anywhere in the rest of the world and the band disbanded in the mid nineties. Dan Reed first tried to go along with Grunge and formed the ill-fated Adrenaline Sky and then more or less disappeared. 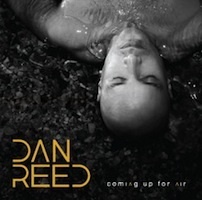 A couple of years ago, Dan started to do mini tours, playing his old Dan Reed Network stuff plus some new material acoustically and announced that he had a new album on the way. Now that it’s finally here, the first listen was a bit of a shock. All the funk and the rock grooves were gone. Instead, what we have here is a mellow and laid back CD, based on acoustic guitars. It didn’t really hit home the first couple of listenings, but fear not, it grows. And it keeps on growing after each listen, plus you instantly recognize Dan Reed’s melodies – you can say what you want about the guy, but you have to give him the fact that he has a sound of his own when it comes to melodies. And after a few spins I’m glad to say that Dan has made a great album. If you liked Dan Reed Network, then you’ll recognize Dan’s melodies, it’s all there, although his new style takes a while to get used to. The title track is beautiful and reminds me of the ballad melodies from Dan Reed Network’s last album The Heat (1991). ”Closer” and ”Brave New World” isn’t as ballady with a bit more tempo, both are killer tunes with brilliant melodies. ”Sacred Ground” once again reminds me of The Heat ballads and ”Reach For The Sun” is a song that feels almost mediocre at first but grows on you while listening to it. ”Pray For Rain” needs to mentioned as well. ”The Dictator” is a spoken word track that feels a bit weird, but the chorus is so brilliant. A deep song about how we’re destroying our planet. Dan Reed has made an album that’s laid back, mellow with lots of ballads, so if all you want is fat rockers and groove, then don’t bother. But if you listen with an open mind and take this for what it is, you will have a great musical hour ahead of you. But no matter how much I love this, I still wish he brought the Network back and do that in parallel with his solo career. Or at least that kind of music. I want to hear Dan Reed rock again.